Cambridge saw the opening of a new mosque which features “a range of cutting-edge green features” earlier in the month. The new mosque is the product of a £23m project to provide for the growing Muslim population of Cambridge and overcrowded existing prayer spaces. It has a prayer capacity of 1000 and an underground carpark for 82 vehicles and 300 bicycles. A spokesperson for the Cambridge Mosque Trust, which are behind the development and completion of the project, told Varsity: “although there have been Muslims in Cambridge for at least a hundred years, [...] the city has, until now, lacked a purpose-built mosque which would cater for the important Muslim segment of the diverse local demography”. They continued that they “wanted the mosque to incarnate the usefulness of faith in the modern context”, and explained the rationale behind the eco-friendly design concept as “it seems obvious that our spiritual traditions should be defending the natural world against human materialism and greed” because they believe that religions see the world as “sacred” and “a beautiful array of signposts pointing to transcendence”. Plans to build the mosque were approved by Cambridge City Council Planning Committee in 2012. Award-winning architects Marks Barfield, who is renowned for designing the London Eye, and Professor Keith Critchlow of the Prince’s School of Traditional Arts, were appointed to design the new mosque. The overall design was developed from the concept of a calm ‘oasis’. The existing community garden will be enlarged with 20 new cypress trees that contribute to a “permeable green edge”. 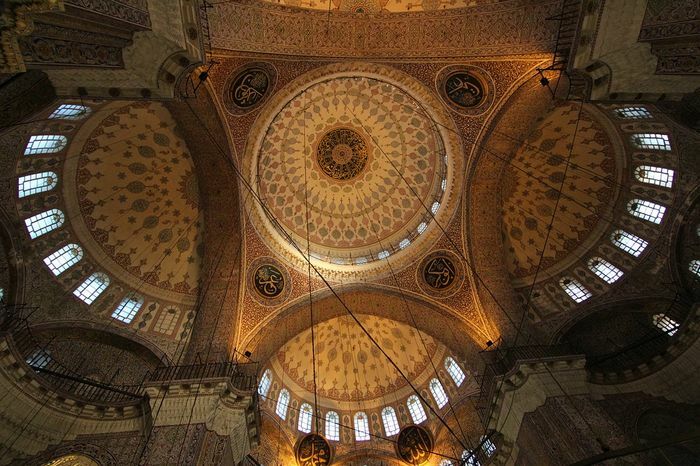 The mosque will be naturally lit throughout the year using large skylights. Natural sustainably sourced and high thermal performance materials are used in its construction to pertain to its eco-friendly ethos. The mosque will utilise locally generated energy to save energy. Energy use will be minimised through the use of mixed mode systems, while renewable energy harvesting heat pumps will be supplying mains electricity. Heat pumps in the basement will locally generate heat for the mosque’s internal temperature. Meanwhile, rainwater will be harvested for flushing and irrigation. Dr Tim Winter, chair of the board of trustees, reaffirmed the Trust’s stance when he told The Cambridge Independent earlier this year that the mosque is “non-sectarian, non-denominational, inclusive, and not ethnic-specific”, stating that “we want to keep access to the mosque really simple”. The site incorporates a large paradise green open to everyone, as well as a cafeteria and some teaching and exhibition spaces. The mosque's spokesperson further told Varsity that “with growing awareness” of climate change, they “hope that other buildings, sacred and secular, will follow” their lead. They continued that “the institutions they represent should also show their moral seriousness by committing to zero-carbon investment policies”. They “hope that it will provide a significant new amenity not only for the Mill Road area but for the whole city”. The mosque opened for prayer on 15 March, and will officially open to all at the end of spring this year. Correction: This article was corrected on Wednesday 27 March 14:52 to correct a misquoted statement from Dr Winter.